Last week, I featured a page from Samuel Whitney's estate record which showed an inventory of items. 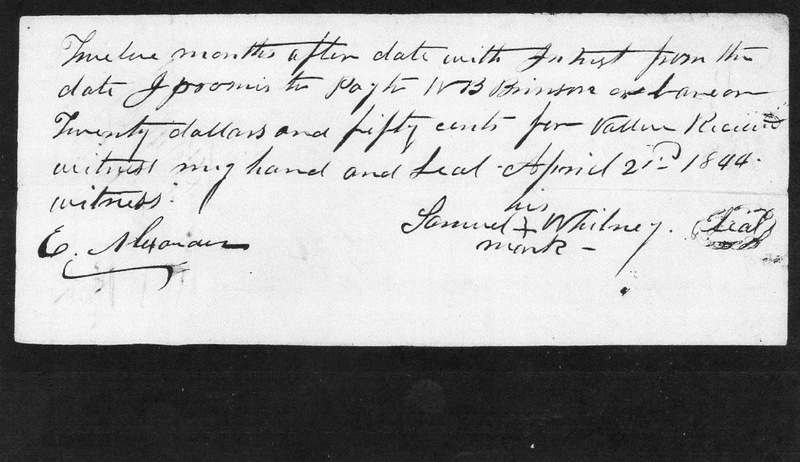 Here's the link in case you missed it Amanuensis Monday: Samuel Whitney's Estate Record. I have to admit I am a little frustrated by the handwriting in the file so it will take me some time to get through it. It appears he died with debts and his belongings were sold off to pay them. Here's a recap on this Samuel Whitney. He was born around 1775 and I believe he was my 4th great grandfather. According to oral history Samuel Whitney was of Portuguese descent originating from the Azores. He is listed in the 1830 and 1840 censuses living in New Bern, NC. In 1830 it's only him and 4 other free males in the household. 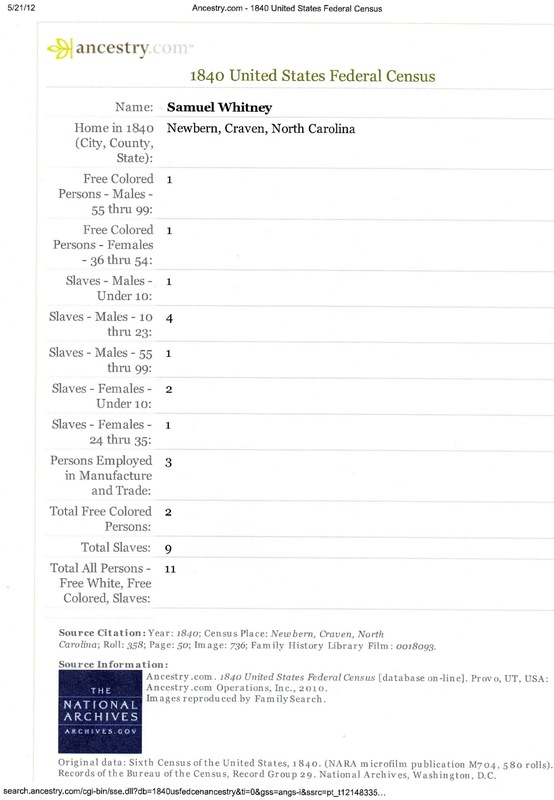 On the 1840 census he is listed as a slave owner? Could these slaves have been possible relatives? Now this is the theory I'm have been working with. If a man of possible Portuguese descent settled in New Bern, he probably didn't look like the other white folks in town. He probably would have been perceived to be a person of color. Who would he have relations with? More than likely either another free person of color or a slave. That's what I believe we see on the 1840 census. Another thing I find intriguing here is that 3 persons were employed in a manufacture or trade. The inventory listing from this Samuel Whitney's estate included blacksmith tools. My 3rd great grandfather was a Thomas Whitney who resided in the Lake Comfort area of Hyde County, NC. On the 1880 census I believe the man who is a border residing with him a Charles Whitney was his brother. Guess what his occupation was? A blacksmith. Oh, yeah, now I just found in the Apprentice Bonds for Craven County, abstracted by Victor T Jones Jr., an entry for a Bill Johnson who was apprenticed to Samuel Whitney in 1815 as a blacksmith! Hmm. Maybe I have something here with this theory. 13 June 1815--Bill Johnson, a boy of color aged 13 years bound to Samuel Whitney as a blacksmith. In 1840 Samuel Whitney is shown owning slaves but mysteriously by 1847 when we are looking at his estate file there are no slaves to be found. Where did they go? I suspect he may have known of his impending demise and set them free. If he hadn't there would have been the risk of them being sold off to pay the debts of his estate. He couldn't risk that if they were kin. Here is a promissory note that was included in the file. "North Carolina Estate Files, 1663--1964," index and images at FamilySearch.org. Twelve months after date with Interest from the date I promise to pay to W. B. Brimms and have a twenty dollars and fifty cents for (value?--not sure) Received witness my hand and Seal April 21st 1844. I am not surprised to see that Samuel Whitney was not able to write as evidenced by him signing this document with an X. I do somehow feel that somewhere within that man, if he indeed is my 4th great grandfather, that not being able to write bothered him deeply. If you go back to the 1880 census I have featured above, it shows that my 3rd great grandfather Thomas Whitney and his sons Samuel and Augustus could indeed read and write. My ancestors who lived in Hyde County, had some schooling. There was a drive for education that came from somewhere, perhaps from Samuel who didn't have the opportunity for an education or perhaps from Thomas his son who saw his father's struggles. One can only speculate.